We are excited to announce the release of a brand new 360/VR multimedia editor that allows our users to annotate 360 images and 360 videos and view them in virtual reality. 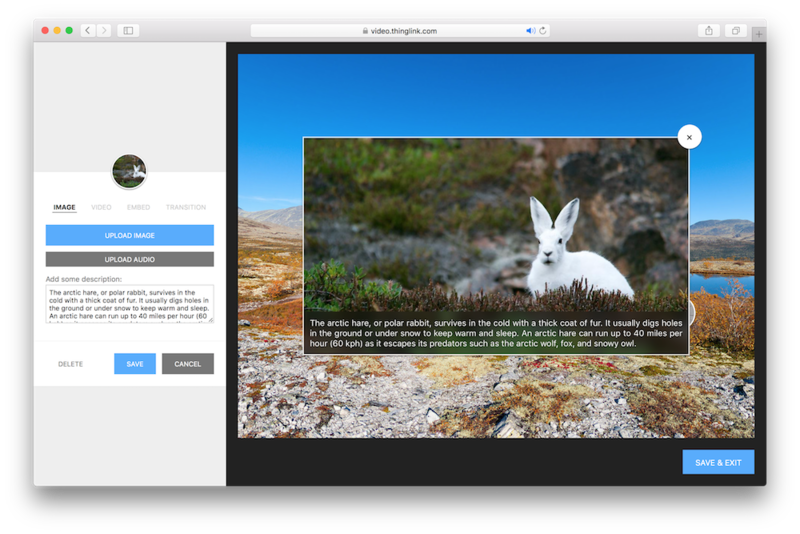 ThingLink’s 360/VR image editor allows users to annotate 360 panoramic images with text, image, and audio annotations as well as web embeds for mobile view. Audio and video annotations play as the viewer aligns a pointer with an icon that is displayed in the picture. The tool is ideal for online publishers, journalists, marketers, educators, and others who want to add rich content to virtual tours, news, sporting events, retail experiences, educational programs, or any application where annotated content can enhance the virtual reality experience. Users also have capability to create a multi-spacial navigation experience by connecting several 360 images or videos together. This allows the creation of truly immersive experiences, making viewers feel as though they are moving from one space to another. The new 360/VR editor also includes a new automatic icon creation feature that make the story creation even faster. Virtual reality is rapidly gaining popularity in online publishing, education, and marketing, and ThingLink’s 360/VR Editor is a powerful, cost-effective way to enhance any mobile VR experience. Our editor makes it possible to add in-depth information to a virtual documentary, enhance a tour of a property for sale, explain strategies in virtual games, expand VR lessons for use in the classroom, and do so much more. And built-in engagement tracking and statistics can help content creators refine their VR experience and provide metrics for future VR applications. How can I access the 360/VR Editor? The new VR/360 editor will be included as part of ThingLink’s new Premium business package ($1,500/year), which provides online publishers with a multimedia tagging platform that supports customized text, audio, video, and more, complete with engagement analytics. Advertisers and marketing creative teams who would like to integrate customized call-to-action options such as eCommerce experiences in the mobile VR view also can work directly with ThingLink’s New York-based VIP services team. Schools have a special version of the new 360/VR editor that is being bundled with the recently launched ThingLink VR Lessons, which is a collection of interactive, 360° image and video journeys on a variety of topics including science, language, and arts. The 360/VR is included with the Premium school subscription package, starting at $500 per year per school. If you are interested please contact rachel@thinglink.com. Want to review the 360/VR editor or VR Lessons? Watch the how to video to preview this new editor!